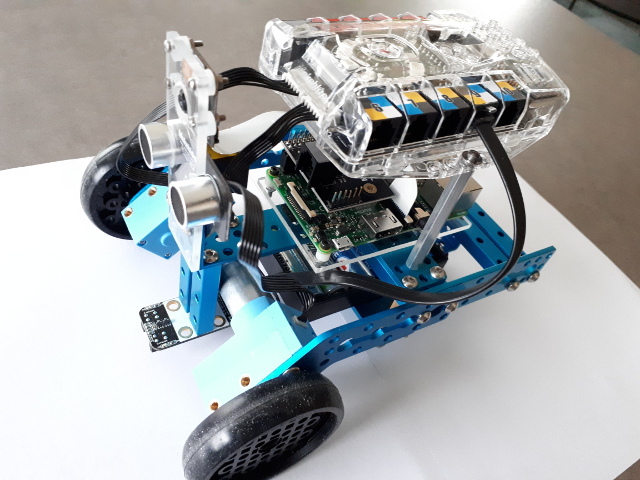 This tutorial explains how to do a position-based visual-servoing with the mBot Ranger educational robot kit equipped with a Raspberry Pi 3 board connected to a camera. we recommend the usage of Raspebby Pi 3 Model B or Model B+ even if the tutorial is also compatible with a Raspberry Pi 2.
an AprilTag that will serve as target for the visual servoing. Print an Apriltag target. 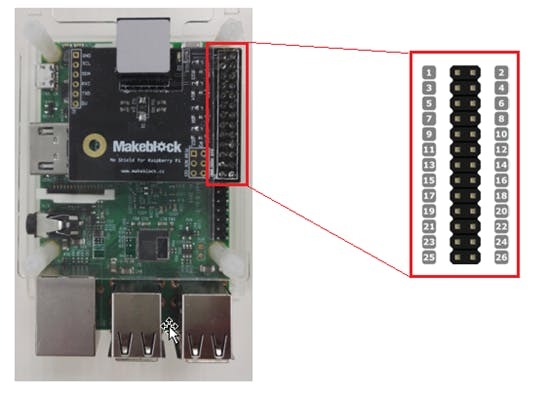 The communication between Raspberry Pi and mBot Auriga board is achieved via a serial link. Images acquired on the Raspberry Pi are processed in order to detect the AprilTag pose. From this pose a visual-servoing computes the velocities that have to be send to the Me Auriga. On the Me Auriga there is an infinite loop that is waiting for velocities that have to be applied to the Dashing Raptor wheels. A watch dog ensure the mobile robot stops when nothing is sent throw the serial link after 1 second. 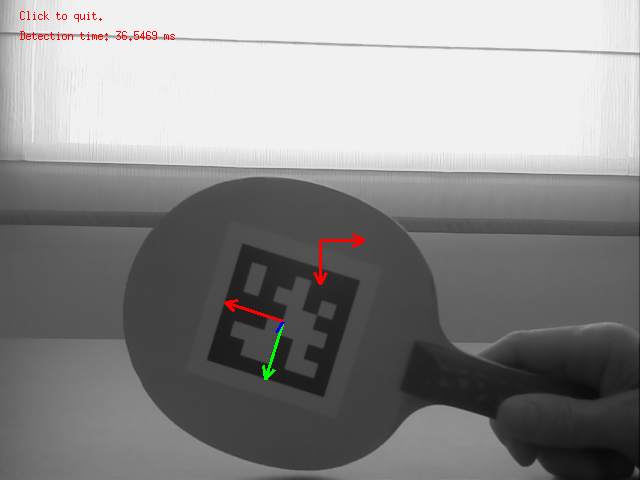 The following video shows the result of this tutorial; the mBot Ranger follows the AprilTag target in order to maintain a given distance between the tag and the camera. Before continuing we recommend that you succeed to follow Tutorial: Installation from source for Raspberry Pi and Tutorial: AprilTag marker detection. First you need to follow these instructions to mount the Dashing Raptor. Mount the Raspberry Pi We use a plexiglass support with dimensions 60 mm by 90 mm to fix the Raspberry Pi on the Dashing Raptor. 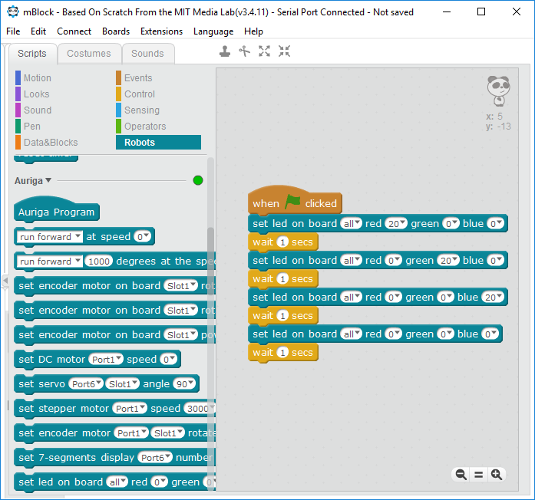 mBlock is a graphical programming software which is designed based on Scratch and compatible with Arduino boards such as Makeblock board like the Me Auriga. Visit the following URL for more details: http://learn.makeblock.com/getting-started-programming-with-mblock-2/. 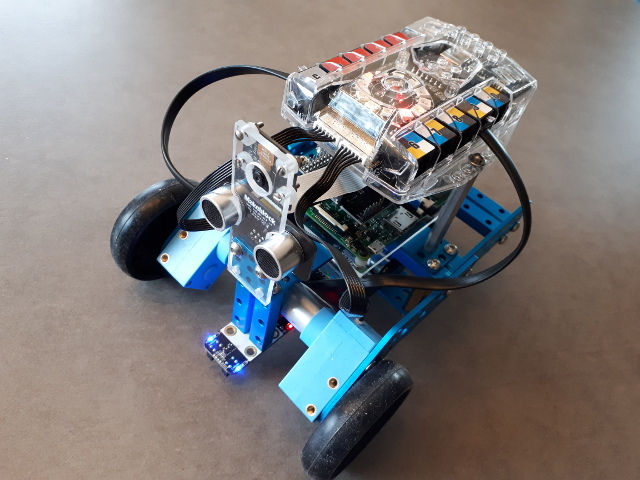 We suggest also to follow the getting started courses http://learn.makeblock.com/ranger-online-course/ if you are not familiar with mBot and mBlock. 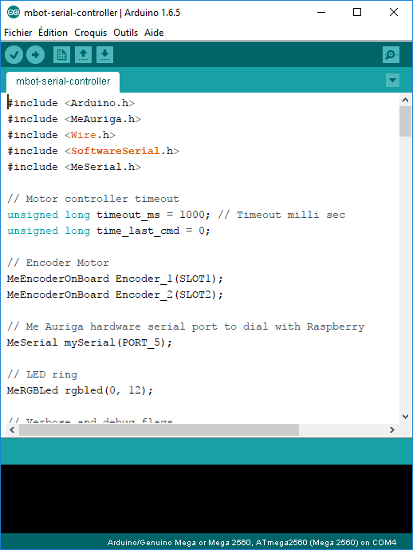 Install Arduino Library for Makeblock Electronic Modules as described in https://github.com/Makeblock-official/Makeblock-Libraries. Then copy C:\temp\Makeblock-Libraries\makeblock into C:\Program Files (x86)\mBlock\Arduino\libraries. This copy requires administration rights. In mBlock, enter menu File > Load Project to load test-ring-led.sb2. In mBlock click on the green flag. You should see the Me Auriga ring led successively red, then green, then blue for 1 sec. We provide mbot-serial-controller.ino file that contains our controller written in Arduino. It has to be compiled and uploaded on Me Auriga board. This file is part of ViSP and located in tutorial/robot/mbot/arduino/mbot-serial-controller. The controller implemented in mbot-serial-controller.ino enables the serial link at 115200 baud and also the motors. In the loop() when a serial data is available with the MOTOR_RPM keyword it applies the corresponding motor velocity to the left and right wheels, and with the LED_RING keyword it turn the ring led on with the corresponding color or off. In this panel, click on Edit with Arduino IDE. It will open the Arduino IDE. Before uploading you need to select the correct board from the Tool > Board menu that should be set to Arduino/Genuino Mega or Mega 2560, and also the correct port from the Tool > Port menu; in our case COM4. 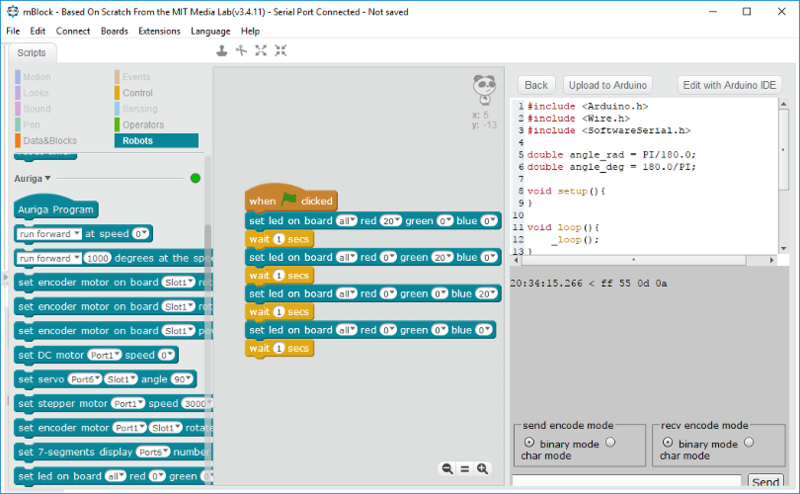 In Arduino IDE, upload the Arduino code to the Me Auriga board entering menu Sketch > Upload. 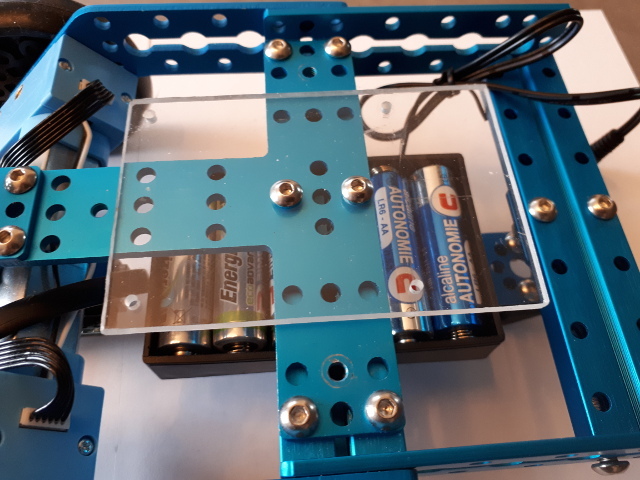 Since in this tutorial we want to control the motors, you need to connect an external power supply using for example six 1.5 Volt batteries. Plug the external power supply to the Me Auriga board, and press the button located on the led ring. This action allows to turn Me Auriga on. In this section we will see how to configure the serial port on Raspberry Pi in order to use the serial port /dev/ttyAMA0 to communicate. Depending on your Raspebrry Pi version this is slightly different. This section is inspired from this tutorial. The following instructions resume what has to be done. Remove console=serial0,115200, save and reboot for changes to take effect. Save and reboot for changes to take effect. We provide hereafter the instructions to configure the serial port on Raspberry Pi 1 or 2 if you don't have a Pi 3 under the hand. 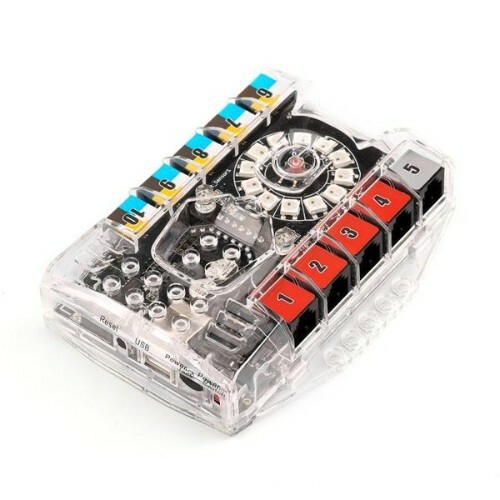 To be able to use the serial port to connect and talk to other devices (e.g. in our case the Me Auriga), the serial port console login needs to be disabled. 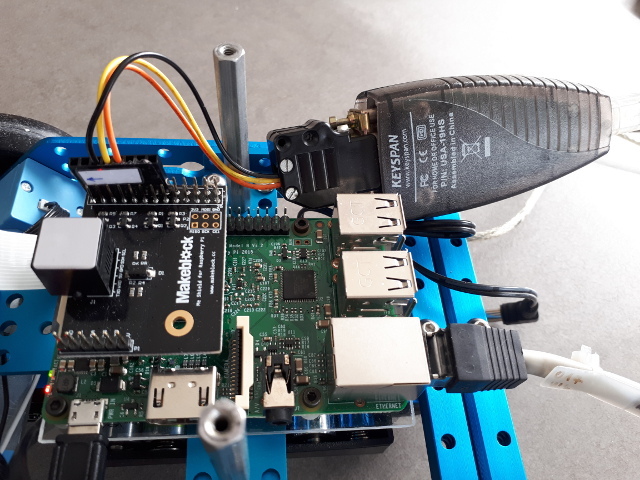 First of all, with the Pi switched off, you’ll need to connect the Camera Module to the Raspberry Pi’s camera port, then start up the Pi and ensure the software is enabled. This could be achieved following this tutorial or this tutorial. 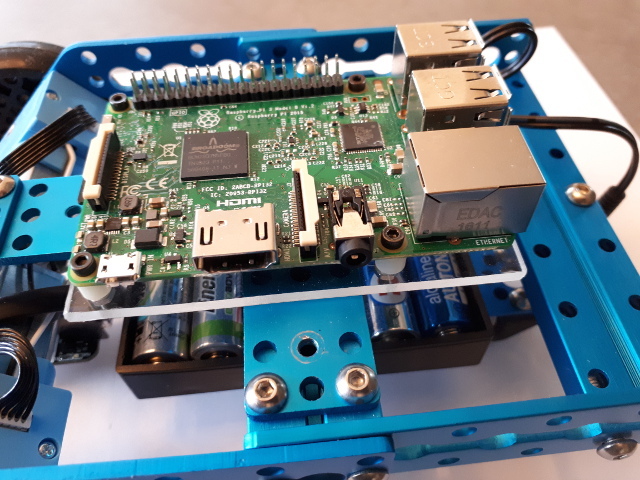 Here we use our Raspberry Pi 3 connected to an external power supply, a RS232/TTL 3-5,5V adapter and a home made adapter that is used to connect the RS232/TTL 3-5,5V adapter to the Raspberry Pi GPIO connector. 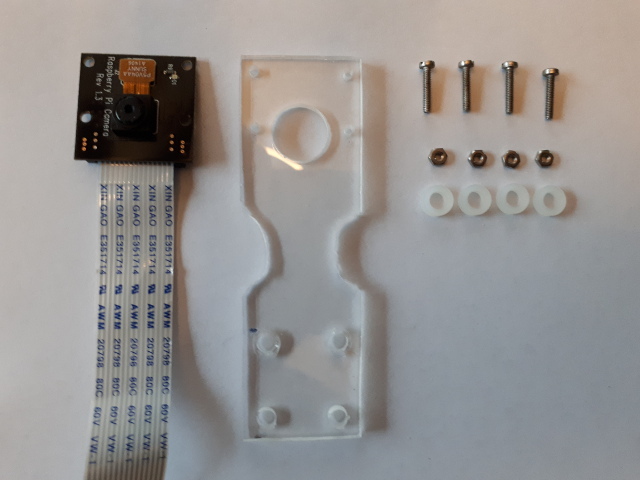 The home made adapter connects Raspberry PI GPIO pins 6 (GND), 8 (TxD UART), 10 (RxD UART) to a RS232 DB9 female connector. Don't forget here to unplug the RJ25 cable between the Me Shield and the Me Auriga board. Now we can use two python files, test-serial-write.py who writes something on the /dev/ttyAMA0 port and the test-serial-read.py that reads on a laptop running Ubuntu 16.04 on /dev/ttyUSB0 port. 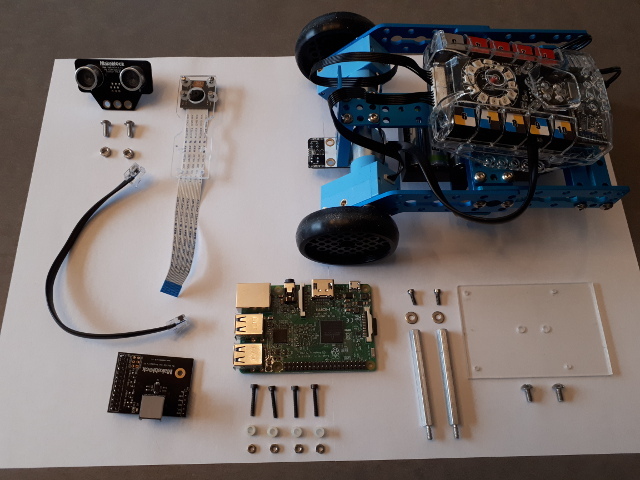 If you build ViSP from source as explained in Tutorial: Installation from source for Raspberry Pi the corresponding python files are available in ViSP source code in /home/pi/visp-ws/visp/robot/mbot/raspberry/python. After running test-serial-write.py you should see lines like Got 5: data: <non alpha characters> on the laptop side. To test if you are able to acquire images from your RPi camera and detect your Apriltag, you may run tutorial-apriltag-detector-live.cpp. If you build ViSP from source as explained in Tutorial: Installation from source for Raspberry Pi the corresponding binary is available in /home/pi/visp-ws/visp-build/tutorial/detection/tag. We suppose here that you have Upload the controller. 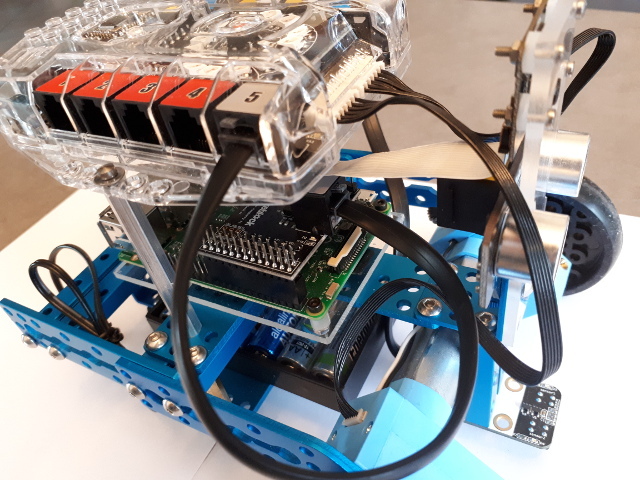 The communication between the uploaded mBot controller and Raspberry Pi is achieved by a serial link using RPi /dev/ttyAMA0 port configured with the following parameters: 115200 baud, 8 bits, parity none, 1 stop bit and no control flow. We implement a basic communication protocol with the following keywords MOTOR_RPM and LED_RING. Each keyword has a set of parameters with comma as separator. The R,G,B color level is in range 0-255. 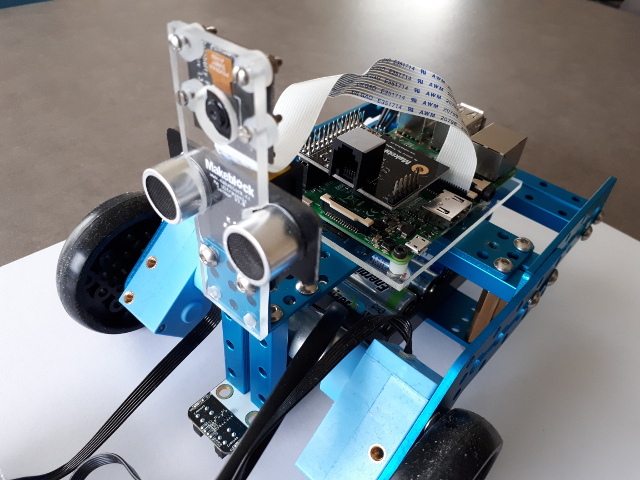 The following sample code shows how to send instructions from Raspberry Pi to mBot controller to turn left wheel at -100 round per minute (RPM), right wheel at 100 RPM, and turn all the ring led on with green intensity set to 10. After 5 seconds, the ring led is turned off. Since in the mBot controller we implement a watch dog, the motors will be stop automatically by the watchdog. We provide a test in test-serial-mbot.cpp that allows to check if instructions send from the Raspberry Pi to the mBot Ranger by serial link is working. If you build ViSP from source as explained in Tutorial: Installation from source for Raspberry Pi the corresponding binary is available in /home/pi/visp-ws/visp/robot/mbot/raspberry/visp. 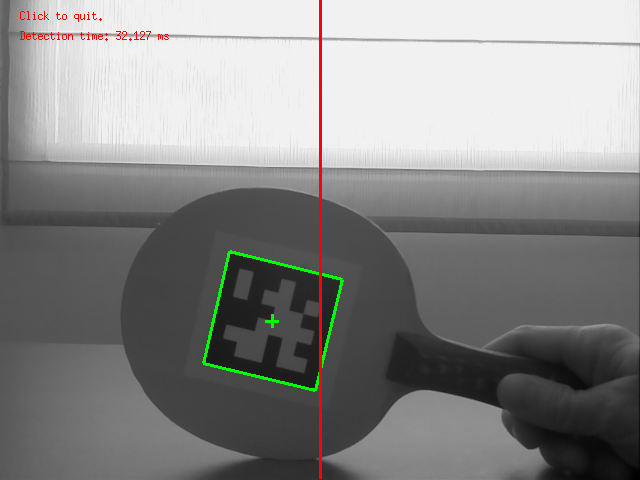 The next step is now to run the image-based visual servoing example implemented in mbot-apriltag-ibvs.cpp. In this example we use two image moments as visual features and especially the normalized gravity center along axis implemented in vpFeatureMomentGravityCenterNormalized and the normalized area implemented in vpFeatureMomentAreaNormalized. 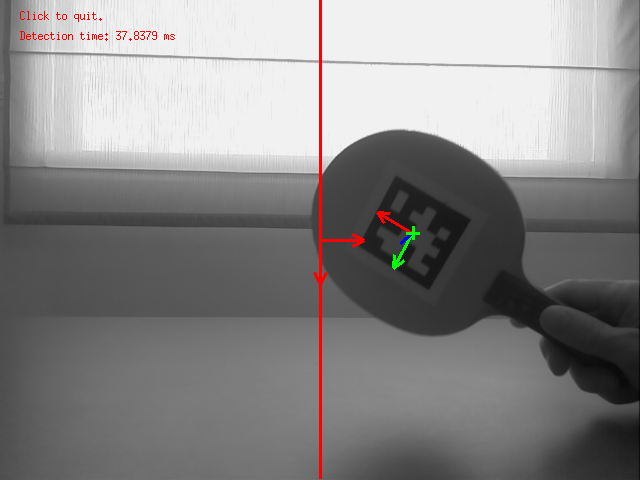 The first one allows to control the orientation of the robot to maintain the target on a vertical line in the middle of the image, while the second feature allows to regulate the distance wrt the target. These features are interesting here since they don't require any 3D information to compute the error vector or the interaction matrix. If you build ViSP from source as explained in Tutorial: Installation from source for Raspberry Pi the corresponding binary is available in /home/pi/visp-ws/visp-build/tutorial/robot/mbot/raspberry/visp/. Since using this option could introduce a lag due to the network connection, we recommend to use it only for curiosity. We provide also a 2D half visual servoing example implemented in mbot-apriltag-2D-half-vs.cpp. This example uses a mix between 2D and 3D visual features and especially the 2D coordinate of the target cog implemented in vpFeaturePoint and the depth feature implemented in vpFeatureDepth. The first one allows to control the orientation of the robot to maintain the target on a vertical line in the middle of the image, while the second feature allows to regulate the distance Z wrt the target. The corresponding binary is available in /home/pi/visp-ws/visp-build/tutorial/robot/mbot/raspberry/visp/. We provide also a position-based visual servoing example implemented in mbot-apriltag-pbvs.cpp. Here we use pure 3D visual features implemented in vpFeaturePoint3D and especially X and Z values obtained from the pose of the tag. It is possible to transform the mbot-apriltag-2D-half-vs demo into a service on the Raspberry Pi in order to start the binary when raspberry has booted. To this end, we need to install a daemon. This example uses a 3D visual features and especially the 3D coordinate of the target 3D frame implemented in vpFeaturePoint3D and the depth feature implemented in vpFeatureDepth. The first one allows to control the orientation of the robot to maintain the target origin frame on a vertical line in the middle of the image, while the second feature allows to regulate the distance Z wrt the target. 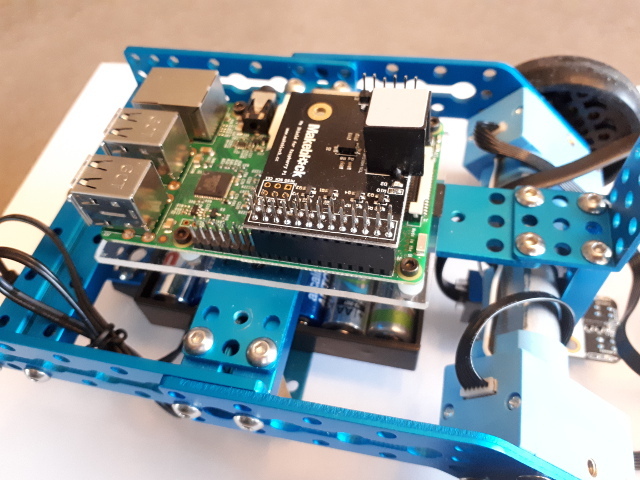 If you follow Tutorial: Installation from source for Raspberry Pi, there is already a daemon in /home/pi/visp-ws/visp/tutorial/robot/mbot/raspberry/daemon. You need to edit visual-servo file and adapt the location of the visual-servo binary location.